Docceo is a Taiwan-based technology company providing Internet of Things (IoT) solutions to the hospitality industry. The founders came up with the brand name after a lengthy process that included looking at words related to their values of service, excellence and technology that helps hospitality companies save money and time. In the end, inspired by a Japanese word, they came with a brand new word – Docceo. Since they invented their own word it is counted as a Coined Trademark. This type is considered the easiest trademark to register since it has no existing meaning in the dictionary. You can read more about Coined Trademarks from this article. To register their Taiwan Trademark they turned to MUSA Trademark. 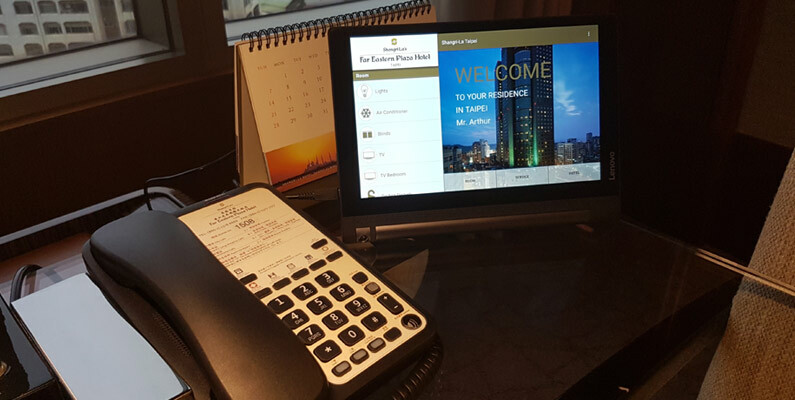 With the ambition to sell their software and hardware all over the world they will soon need to protect their brand in many countries, but they start in their home market, Taiwan where they also found their first customer Shangri-La’s Far Eastern Plaza Hotel. Docceo chose not to apply for a trademark for their Chinese name but usually we would advice all our clients to do so. It is very common for customers to refer to a company by the Chinese name and if so it should be protected. Docceo uses its corporate logo in several colors and sometimes reversed (white letters on solid background). Therefore we submitted a black and white logo to TIPO as to not lock in any specific color. Docceo also applied for a trademark for their product name – DigiJames. They explain the name as “Digital” for how their system is helping digitizing hospitality services that previously has been exclusively analog and human. James is a name of a quintessential butler catering to your every need, especially like the DigiJames system assist their customers to do. The trademark searches showed that there were many other existing registrations for words with the form Digi+X and X+James. This told us that the TIPO would likely accept our application since there were no exact match. The DigiJames trademark we applied for is a combination of the word and the “bow tie” icon. This was done because the trademark searches showed that there were many similar “laying eight” or infinity symbol icons registered in Taiwan. Even if none of them were exactly the same, we advised Docceo to apply for a combined mark. As a technology company MUSA advised them to apply for the trademark class 09 which covers many different Computers and Scientific Devices. When you plan to sell worldwide, it is important that you have a brand and trademark protection strategy. This is especially true when you’re in the technology space where it’s very easy to manufacture and copy the product. Want to figure out which trademark classes are suitable for you? Download our trademark class list here. To learn more about Docceo, please visit their website. Find their trademarks for Docceo and DigiJames.